Open source has become an imperative part of every developer’s arsenal. The potential to gather assistance from the community and the capacity to link into a range of systems and solutions make open source incredibly powerful. As open source software becomes ubiquitous, and used by the vast majority of enterprises throughout the world, 2017 is all set for vendors of application delivery controller (ADC) to start providing improved and tighter integration packages for various open source projects, especially surrounding ADC-generated telemetry. Companies have been extensively using their analytics and machine learning capabilities for quite some time to identify actionable patterns from the collected data. With the rising demand for business intelligence, this year is foreseen to be the year of information superiority with businesses, leveraging data as a key differentiator. In the past couple of years, containers have been emerging as an imminent trend. As the business focus starkly shifts on rightsizing of resources, containers are expected to become a common phenomenon, giving businesses the ability to leverage highly portable assets and make the move into micro services much simpler. Adjacently, automation has become essential now. Mostly intensified by DevOps adoption, the automation of software delivery and infrastructure changes have freed developers to spend more time creating and less time worrying about infrastructure. In this edition of CIOReview, we present you the “20 Most Promising Open Source Solution Providers 2017,” featuring the best-in-breed implementation of the framework for businesses. Over the last few months, a distinguished panel comprising CEOs, CIOs, VCs, analysts, and CIOReview’s editorial board reviewed the top open source solution providers that empower developers to share and learn through collaboration and have selected the ones that are at the forefront of delivering innovation. 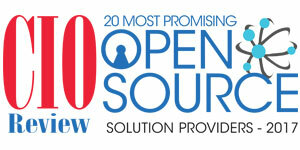 We present to you “20 Most Promising Open Source Solution Providers - 2017”.